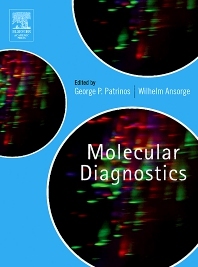 Molecular Diagnostics covers current molecular biological techniques used to identify the underlying molecular defects in inherited disease. Although an increasing number of laboratories, both academic and private are moving in that direction, there are only a few books in the existing literature, and they deal only partly with diagnosis at the molecular level. Each chapter includes the principle and a brief description of the technique, followed by exmples from the authors' own epertise. Contributors are well-known experts in their field, and derive from a variety of disciplines, to ensure breadth and depth of coverage. 23.1 WHAT IS PREIMPLANTATION GENETIC DIAGNOSIS? 31.5 CAN PREVENTION PROGRAMS BE CONSIDERED EUGENICS? Dr. George Patrinos is an Associate Professor at the University of Patras School of Health Sciences (Department of Pharmacy) in Patras, Greece with Adjunct positions in Rotterdam, the Netherlands and Al-Ain, United Arab Emirates. His research interests span the fields of molecular diagnostics, high-throughput mutation screening, the development of online mutation diagnostic tools, and the implementation of genomics into healthcare, particularly for health systems in developing countries. George Patrinos has published more than 170 scientific papers in peer reviewed journals on topics related to genetics, genomic medicine, pharmacogenomics, molecular diagnostics, and social and economic evaluation for genomic medicine. Dr. Patrinos is also the co-author of Economic Evaluation in Genomic Medicine (2015) and co-Editor of Molecular Diagnostics, Second Edition (2009), both published by Elsevier, and serves as Communicating Editor for the journal Human Mutation. Additionally, he is co-organizer of the international meeting series “Golden Helix Symposia” and “Golden Helix Pharmacogenomics Days”. Department of Pharmacy, University of Patras School of Health Sciences, Patras, Greece United Arab Emirates University, College of Medicine and Health Sciences, Department of Pathology, Al-Ain, UAE; Erasmus University Medical Center, School of Medicine and Health Sciences, Department of Pathology – Bioinformatics Unit, Rotterdam, the Netherlands. Prof. Dr. Wilhelm Ansorge is a Senior Research Scientist and coordinator of the Biochemical Instrumentation Programme at the European Molecular Biology Laboratory in Heidelberg, Germany. His research interests include the development of the first complete Human Genome microarray, with numerous applications in gene expression studies and high-throughput Molecular Diagnostics.